While the weather has been a bit cool for spring fever to rise, there are ways to bring spring to life inside your home. I have been redecorating with the theme of renewal. As I pack up objects that have I have treasured through out the winter, I think spring. With a thoughtful eye, I rearrange and redecorate to brighten the home with color. Turquoise has been the trendy color of the season. Looking for turquoise colored pillows for my newly renovated family room led me shopping tonight. After a few weeks of searching I found what I thought would add a touch of spring to the room. Alongside turquoise vases, plates, and towels were my lucky find. I am proud that I made the right color choice to brighten my house. While I wait for the Mother Nature to sprinkle the earth with dustings of color and blossoms of variegated hues, I intermix faux flowers and branches to bring spring inside. Words float in my mind creating a poetic expression of color fitting of spring. As I surf the internet tonight searching for decorating ideas, I come across a blog post in which the author shares the same feelings I have about spring's late to the show entrance. Bringing spring inside helps me think spring. Soon, spring will decide to find a home and enjoy a much anticipated stay. 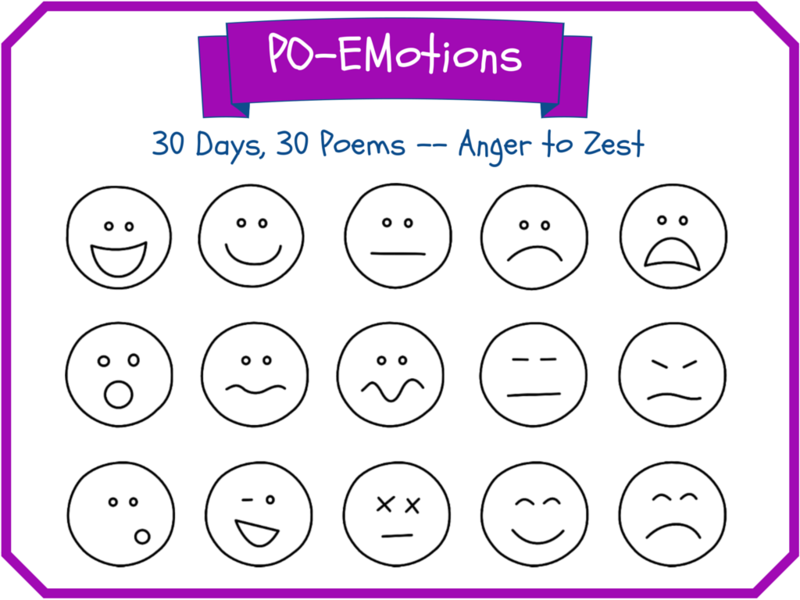 Mary Lee Hahn is the creator of PO-EMotions. The emotion of the day is PRIDE. Thank you for joining my Poetry Parade. Did you ever stop to reflect on why there is such a bounty of positive feelings during the month of April? Is it the opportunity to become one with nature or the rebirth of life that makes humans want to break out of the cold weather months or be unencumbered by heavy and dark clothes to feel the warmth of a new season? I do know that I feel optimistically positive during the month of April. It happened last year and once again this year. April signifies abundance: the opening of the spring season, voices raised in poetic writing, and the joy of the awakening of the earth. 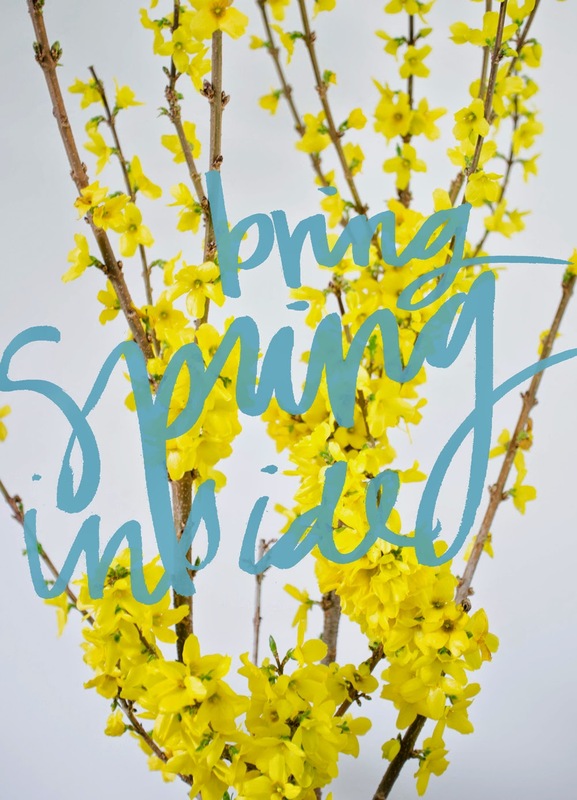 April is a month of possibilities and opportunities to break out of a sheltered cocoon to feel a newness and freedom from old ways and routines. Last April, I felt a strong creative surge and so I designed the second virtual gallery of artistic expressions, April Awakenings. The gallery became my outlet for creative thought and a rebirth of poetic compositions. For quite some time prior to that season, I was not weaving thoughts as frequently as in the past. Because I was reflecting in quiet and my voice needed to join with others, I felt a strong pull to create a community of reflective writers. 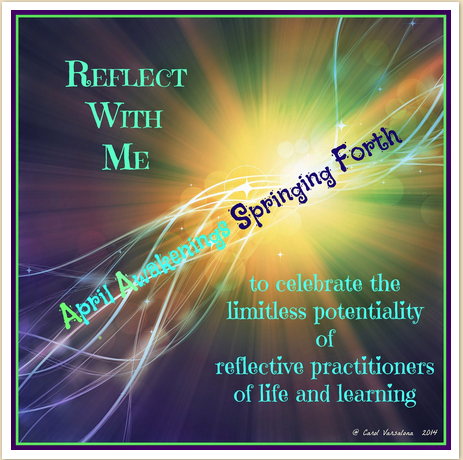 April Awakenings was a way to renew my journey of writing and provide a space for voices to come together. 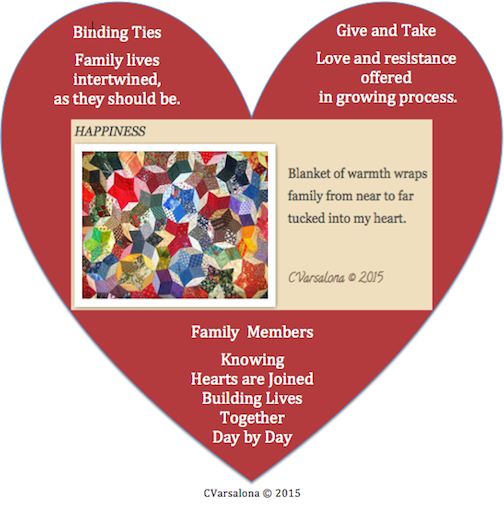 You can access the April Awakenings Virtual Gallery here. 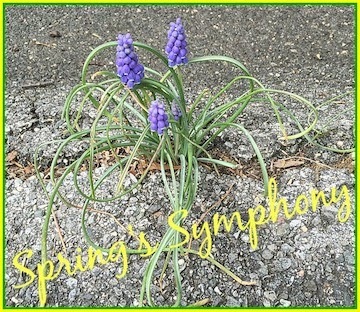 My Poetry Parade will continue after the month of April, throughout the season of spring with a new gallery, Spring's Symphony. 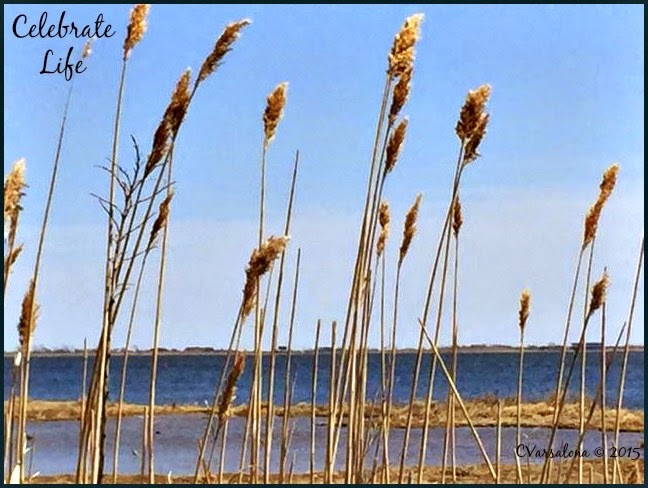 I am optimistic that reflective writers will listen for the music of springtime to compose poems paired with photos that will give tribute to a season of renewal. I wrote the following as a tweet during one of Monday night's chats and it is a fitting ending to my post. Blogging is the act of allowing your voice to be raised as you reach out to others. As our lives move in constant motion with daily tasks, work expectations, household needs, and family commitments, we need to rethink living. Today is #CelebrateMonday so find peace and contentment in all that you do. time needs space to kick back. find natural beauty surrounding you. Leave the hectic pace behind. At the close of the day, be filled with peace. While blossoms are late this year and the weather is not near as springy as we would like, there is a transformation occurring. Life is being renewed. Spring is in the air. At Mary Lee Hahn's PO-EMotions, contentment is the emotion of the day. I am content word weaving as I am in awe of springtime life. 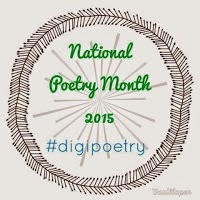 Please visit PO-EMotions along with #digipoety as we continue to celebrate National Poetry Month. In reflecting on my week, I realized that each day was a celebration of good cheer: people to people learning and thriving together. A spirit of positivity allowed for the week to flow despite drops in temperature and heavy rains. Spring offered sunshine amidst the showers. 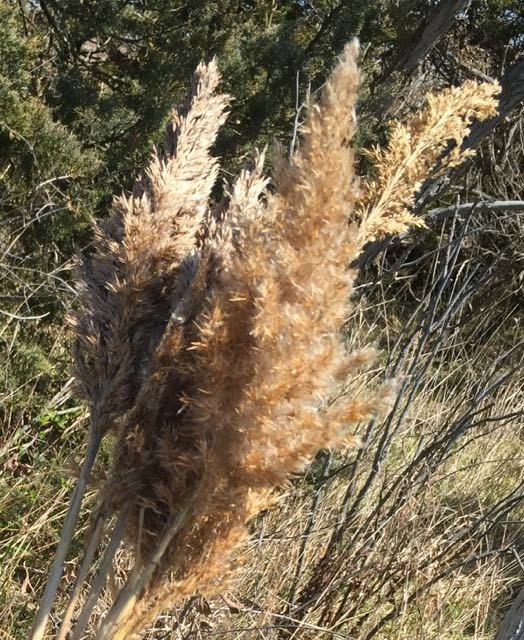 Sunday's breezy weather allowed for a walk with family in the nearby nature preserve. Moments were savored before the my daughter and son-in-law had to return to Washington, DC. as birds sweep across the salt marsh coast. while hopeful visitors and bird watchers view. mother bird cares for her babies' needs. photographers capture father bird's flight. and nature's chatter is softly heard. so observe, reflect, and engage in talk. Enjoy springtime during a nature walk. 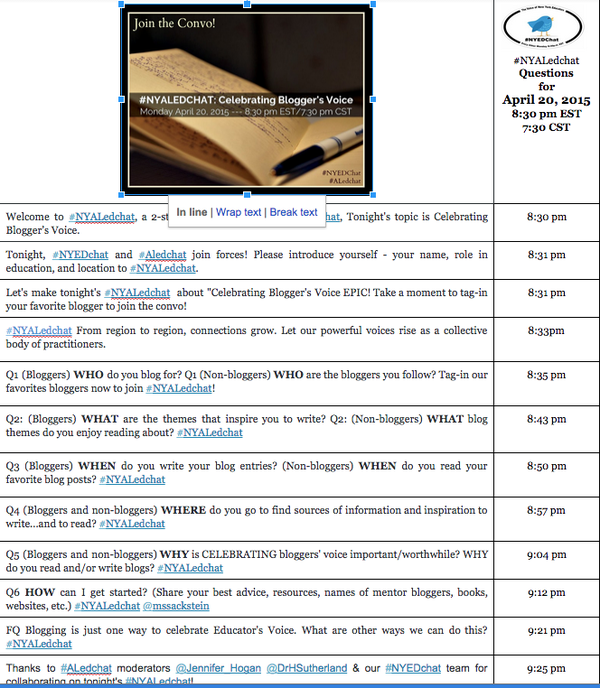 Monday night, NYEDChat moderators eagerly opened connections on Twitter with ALedchat to air a new educational chat, #NYALedchat that trended on Twitter. The celebration of blogger's voice allowed for an active discussion on the importance of the message being delivered and the building of connections across regions. You can read about the amazing celebration here. The rains and sudden drops in temperature may have had Long Islanders questioning spring's arrival but good cheer remained throughout the week. Congratulations were exchanged for a baby's birth and a baby announcement. Long talks with friends occurred. Poetry was written daily and the spirit of camaraderie allowed for assessment gatherings to be pleasant. 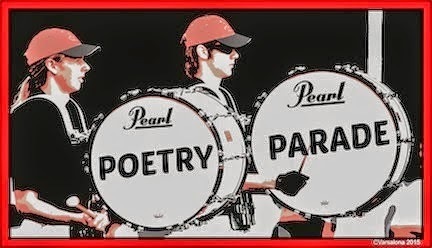 Additional poems written this week can be read here and here. To round off the digital experience, here is a catchy tune that will capture the feeling of cheerfulness. You may wish to use this in school presentations of springtime delights. Celebrate This Week with Ruth Ayres who is celebrating with a little list of her loves. 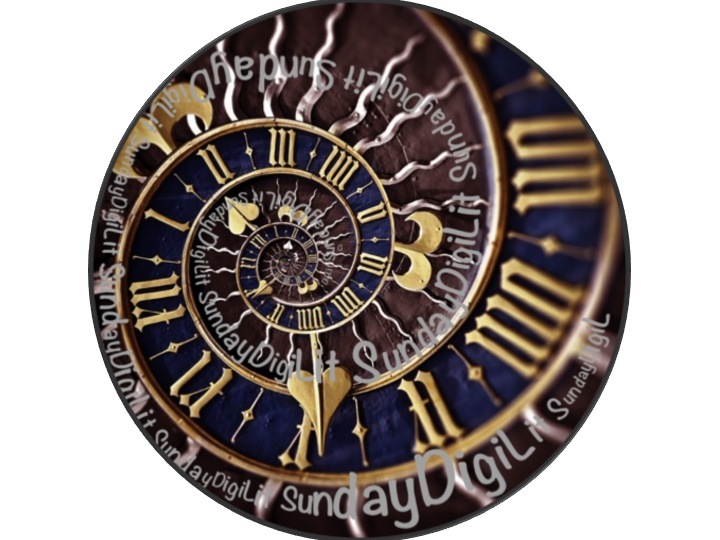 Today is DigiLit Sunday so please visit Margaret Simon's site, Reflections on the Teche, for additional readings. 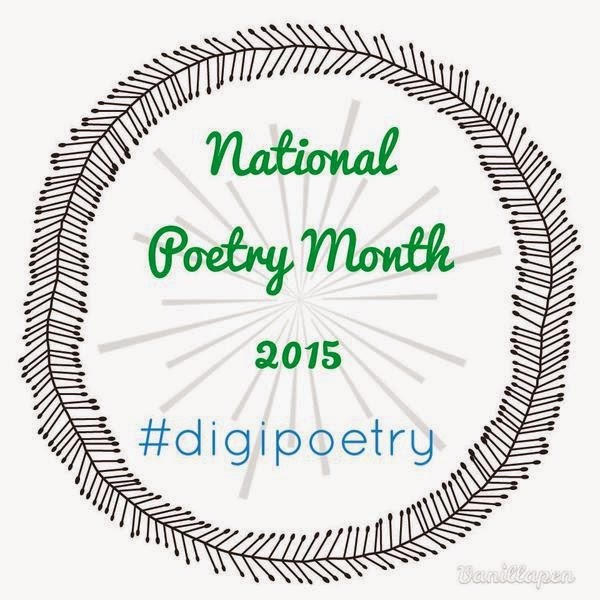 This month, poetry is alive at #digipoetry (site created by Margaret Simon and logo by Leigh Anne Eck). Please visit. 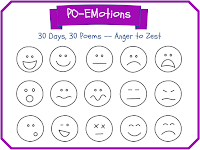 Mary Lee Hahn has created a site, PO-EMotions, for those interested in penning poems dealing with a range of emotions. Yesterday the emotion was cheerfulness. The good cheer noted in my poem is my addition to her poems for the day. 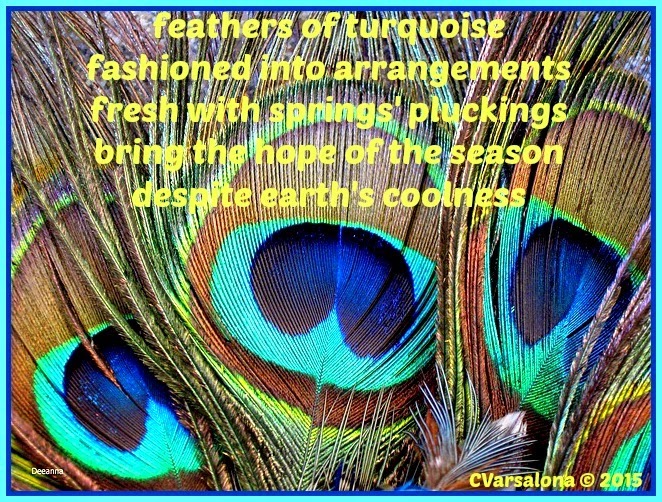 I will continue to celebrate poetry during the month of May when I will start collecting offerings for the online global gallery of artistic expressions, Spring's Symphony, that I announced last Sunday. During my the early years of my marriage, I was fascinated by the Victorian era. I spent many a weekend antiquing, reading about era, and decorating my home. I was so immersed in the time period that my personal email name became lady1890, an antique/vintage clothing collection was stored in a costume trunk for children's pleasure, and a Victorian Tea Birthday Party was held for five-year-ols. A few years later, I designed various school-wide, young historian projects that featured artifact collections and docents dressed in period costume. For those events, I found a pair of Victorian bloomers with lace edging that I proudly wore with a white cotton dress, vintage-looking heels, a jeweled flag pin, gloves, and a fetching hat. The photo is unavailable but the memories remain. My poem today is written for Laura Shovan's clothing poem project, What Are You Wearing. Today's clothing poem prompt is vintage. adorned many female bodies of yore. for Victorian ladies-a lingerie treat? when you have a costume run. 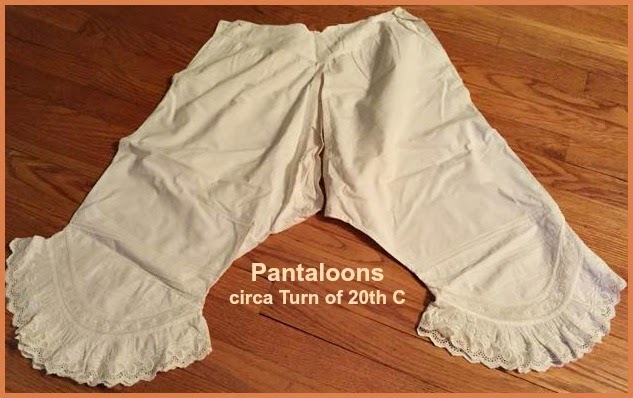 just be careful your bloomers don't show. you wouldn't want to shock your beau. Today, Poetry Friday is being hosted by Renee LaTulippe at No Water Rising. 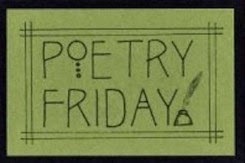 There you will find a variety of offerings to celebrate poetry during National Poetry Month and Renee's handy Poetry Friday 101 ntoice to learn more about the weekly Friday event. A special thanks goes out to Jama Rattigan for including Winter Whisperings Gallery on her 2015 National Poetry Month Kidlitosphere Events Roundup. In the online gallery poems from some Poetry Friday contributors and a featured poem by J. Patrick Lewis, the originator of the zeno can be found. Thank you for joining my Poetry Parade. I will continue to celebrate poetry during the month of May when I will start collecting offerings for the online global gallery of artistic expressions, Spring's Symphony. Please consider joining me. 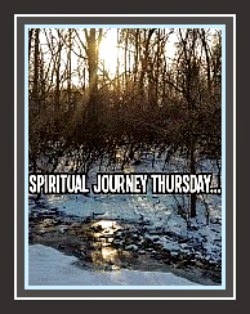 Today, is Spiritual Journey Thursday. The community gathers together at Holly Mueller's site, Reading, Teaching, Learning, to pen thoughts around today's topic, family. Please visit and read the various posts. 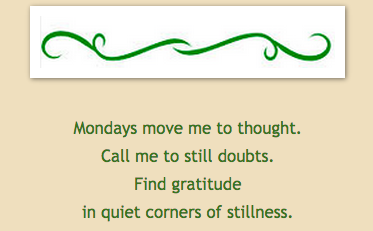 This month, poetry is alive and being published daily at #digipoetry, the site created by Margaret Simon.